At InterEngineering, we try to keep on top of what the industry is doing to promote and improve LGBT diversity and inclusion; and do the best we can to support these initiatives. Last week three prominent magazines in construction (including New Civil Engineer; the Institute of Civil Engineers’ official magazine) responded to criticism from Stonewall after no built environment companies managed to place within the top 100 of its annual Workplace Equality index. As just over 6% of the whole UK job market is in construction, that only 0.6% of the Diversity Champions work in this field is disappointing, and demonstrates just how far behind engineering really is with its diversity and inclusion agenda. Whilst more data on diversity can only be a good thing, the real excitement comes from seeing LGBT diversity back in the news again. 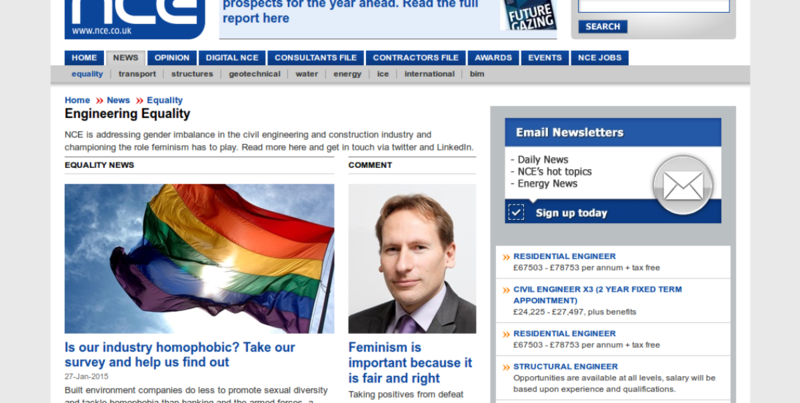 It’s the first time since the E&T survey, last July, that topic has been discussed in the construction press; which has recently been championing greater equality within (civil and structural) engineering. If you are a civil or structural engineer, please take some time to fill out the Attitudes In Construction survey.